Argentina’s first-round vote on October 27 will see the election of president and vice president, and nearly half of congressional seats (130 deputies and 24 senators). While President Mauricio Macri is in the running for a second term, Argentines will decide who will officially be on the ballot in the August 11 primary elections, known as the PASO. The main obstacles to the pro-business president of the Let’s Change coalition are Argentina’s economic recession and a peronist front with or without former President Cristina Fernández de Kirchner. Other precandidates ahead of the PASO include Sergio Massa, who leads the peronist Renewal Front and ran on the Justicialist Party ticket in 2015, and his colleague and competitor, Salta Governor Juan Manuel Urtubey. Some 33 million Argentines are eligible to cast the compulsory vote, which will go on to a December runoff if none of the presidential candidates wins at least 50 percent, or 40 percent with a 10-point margin over the runner-up. Topping the list of voter concerns? Jobs, inflation, poverty, as well as a growing concern over security issues. >> Find out about other elections in our main 2019 Election Guide. Macri and Kirchner are garnering the most attention ahead of Argentina's October vote. But there's room for a dark horse. Public dissent and legal challenges have slowed implementation of President Mauricio Macri’s 2017 reform. From gubernatorial PASOs to the first-ever mandatory presidential debates, AS/COA Online outlines key dates ahead of October 27 general elections. An expert panel in New York agreed the country's economic prospects look to improve in 2019 over the previous year and will be a key factor in October's presidential election. Argentina’s dark-horse presidential candidate speaks to AQ about his vision for uniting the country. 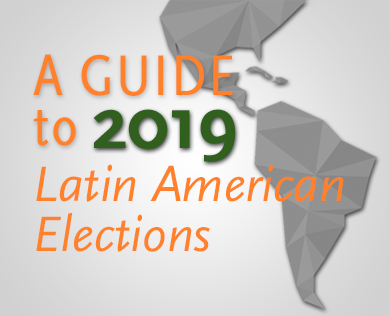 AS/COA Online takes a look at upcoming presidential races in Argentina, Bolivia, El Salvador, Guatemala, Panama, and Uruguay. Another controversial maverick hits the campaign trail in Latin America. Could This Argentine TV Host Be Latin America’s Next ‘Outsider’ President? A year out from Argentina's election, a familiar face is testing political waters. Argentina’s president is struggling with an economic crisis. His predecessor is implicated in a huge corruption case. Is there room for another challenger? Los gobernadores de Salta y Mendoza hablaron de la importancia de la transparencia en la política y en los mercados para la mejoría de la economía argentina. Cinco miembros del gabinete, dos gobernadores, un alcalde, líderes del sector privado y otros se reunieron durante la decimoquinta conferencia anual de AS/COA en Buenos Aires.